Once happy with a style we size grade the pattern, based on standard body metrics. We notch the patterns to indicate where the pattern pieces fit together. If this is a new product we make a first batch to test the graded patterns sew together correctly. When we create a new design, we make up 2 identical samples. One gets worn, tested for comfort and practicality, and to gauge reaction from friends and family. This sample is then machine washed and compared to the other garment. We like to know how our products wash so we can advise accordingly. 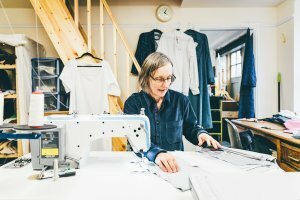 Throughput – We like to cut a small batch of one style, from 4 to 12 garments. These get cut and made in a space of 1 to 3 days. We find this way of working to be most efficient and gives the best quality result. 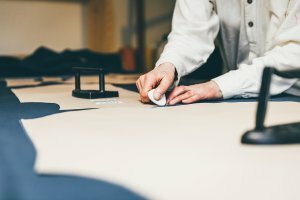 Cutting the cloth – Most of our cloths are 60” wide. We place the selvedge together and spread folded edge to edge onto the cutting table. We lay the patterns directly onto the cloth and draw round, using tailors chalk. We cut using large shears or a small rotary knife. Cutting the linings – only the waistcoats have linings to cut, but our cord shirts have a contrast cloth to cut too. 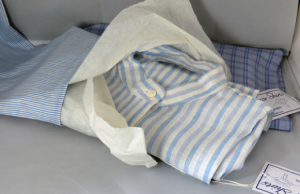 Interlinings – all garments (except our chemises) have interlinings which give body to collars, cuffs and lapels. 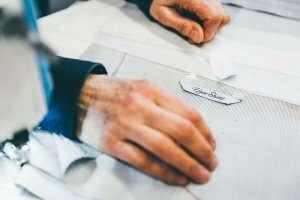 For the waistcoat welts we use heat and a small press to fuse the interlining to the welts and facings – the stabilisation required for a good tailored garment. 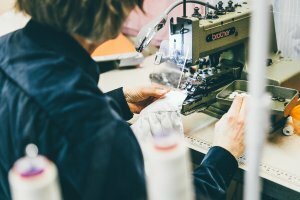 Most of the sewing is on a standard industrial lockstitch machine. 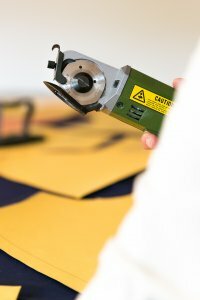 We have invested in new Jack machines (with underbed thread trimmer and needle positioning motors). For the long body seams we use either a 4 thread Jack or 5-thread Wilcox & Gibbs overlocker. For buttonholes we have a pair of Brother industrial sewing machine – a buttonholer and a buttonsewer. Then it’s back to the low technology of a good steam iron for a final pressing. After folding, we pack our garments into a matching cloth bag or gift box (if the customer prefers). We avoid the use of plastic bags as we are conscious of their environmental impact and their surface also attracts dust.